Parents at Downhills Primary School in Tottenham caused Ministers to reject advice from their own civil servants, according to a briefing document leaked to the Guardian from the Department for Education. Concerned about the rising cost of forcing unpopular private academy chains on to unwilling communities, DfE officials had suggested abandoning the project but Secretary of State Michael Gove and David Laws, Schools Minister apparently replied “No – totally wrong” and “really important” http://www.theguardian.com/education/2013/oct/21/ministers-ignore-forced-academy-advice . 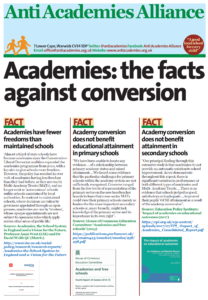 Clearly, the DfE’s target was the bald number of academy conversions to satisfy Gove’s vanity project but, with few primary schools choosing to convert, the leaked document shows civil servants were worried that they would not “meet ministerial demand on numbers of academies” unless the forced academisations continued. Downhills parents knew their school did not need academy status; it was improving as a community school with 67% of children achieving the expected level in Maths and English combined. In 2012, Year Six pupils at Roke Primary School in Surrey achieved 81% in maths and 88% in English – above the national average – but their school was forced to convert. And when Roke’s governors chose a local secondary school as sponsor, they were told by DfE officials that they would be fired and “we will put in our own board of governors who will do what we say”. The school was forced to join the expanding Harris chain although the DfE refuse to say how that particular sponsor was chosen. Academies are not the panacea to school improvement; ever increasing numbers are being graded as inadequate or requiring improvement by Ofsted and there are allegations of gaming and cheating to inflate grades. 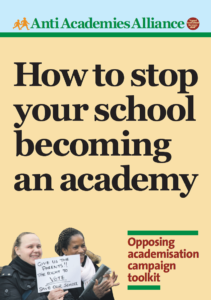 (http://www.independent.co.uk/news/education/education-news/insider-claims-top-academy-inflated-grades-8846573.html) Recent press interest in free schools – academies by another name – is revealing the dangers of fragmentation and the free market. 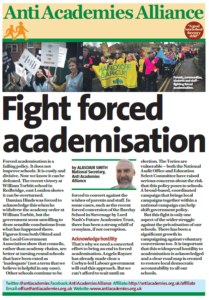 Julie Davies of Haringey NUT says “Thousands of pounds a day are still being wasted on lawyers, accountants and on academy brokers – consultants sent by the DfE – to bully school leaders and governors. This is an extortionate waste of taxpayers’ money and a distraction from the real business of teaching and learning”. One academy broker told governors to imagine they were a frog in a pan of water with the heat being turned up and asked whether they wanted to jump now or later. Downhills parent Wendy Sugarman said “It looks like we were close to breaking this awful undemocratic policy. We urge other parents and school communities to carry on the campaign”. One school where the fight continues is Snaresbrook Primary in Barking and Dagenham. Parents are taking their case to Michael Gove at the Department for Education at 11am on Friday 1 November. Join them at Sanctuary Buildings, 20 Great Smith Street, London SW1P 3BT. This entry was posted in Blog, News, Top story and tagged Forced academisation, Parents, Primary, Rejecting Academy. Bookmark the permalink.